Soho Gourmet manage the design and manufacture of all of our wood fired ovens from start to finish. Put your special occasion in the hands of a team who consider and manage all of the details. Mini 1 was our first car conversion. 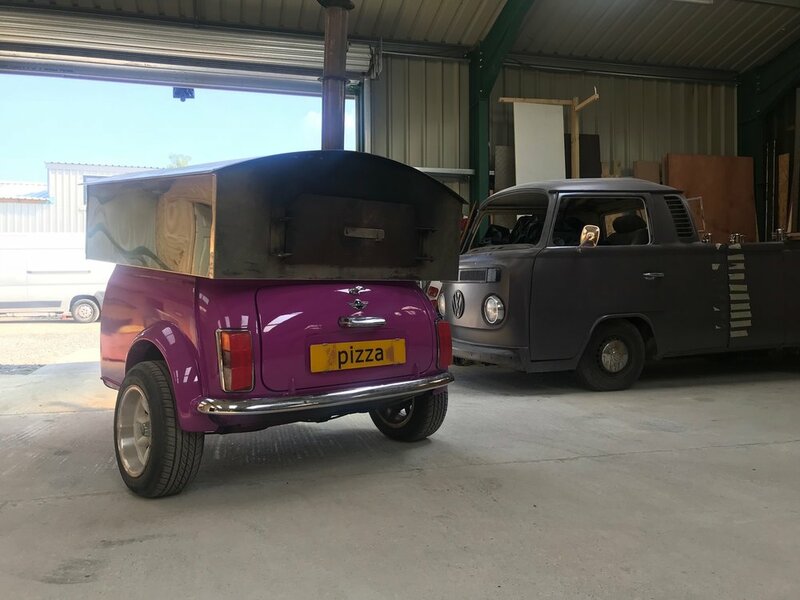 A wonderful addition to the Soho Gourmet range of ovens that utilises the iconic Mini cooper as the base of our trailer. We have built an oven cable of cooking up to 8 pizzas at a time. We are very proud of this amazing oven and it certainly turns heads at the events it attends. Dimensions: 1.85m wide and 2.3m long. The Piccollo oven is incredibly versatile and a real favourite of the team. Custom made, with a polished stainless steal exterior, it has a heated lower storage compartment cable of keeping boxed pizzas warm for over an hour. Piccollo can cook up to 5 or 6 pizzas at once, reaching temperatures of over 550 degrees, creating stone baked pizzas of the highest quality. Dimensions: 1.65m wide and 2.2m long. Mini 2 is our newest design. Another iconic Mini cooper, but this time a twin axel version. We have built another oven cable of cooking up to 8 pizzas at a time. Our very first oven...so a lot of history for us.....this is a traditional clay wood fired pizza oven. Sitting on an Ifor Williams trailer this is still a favourite of Mark and Kris. It can cook up to 6 pizzas at once, reaches over 600 degrees and sits within a very stylish stainless steel clad trailer. A truly epic oven. Dimensions: 2.2m wide and 3.2m long. So what's next..........we have great plans for this beauty...watch this space!!! !